IBM researchers have created computers the size of a grain of rock salt that could someday be embedded in every product shipped and used to track it and maintain its authenticity. Within five years, IBM researchers hope to deploy granular microcomputers that, in conjunction with a blockchain electronic ledger, could be used to verify and track goods all over the world. IBM has created a microcomputer technology called cryptographic anchors (abbreviated: crypto-anchors) and says they could be used to authenticate anything from pharmaceuticals to luxury goods, such as diamonds, from point of origin to merchant. Fraud costs the global economy more than $600 billion a year, according to IBM, and in some countries, nearly 70% of certain drugs are counterfeit. Supply chains can be made up of dozens of entities – from shipper to exporter, importer and freight forwarders – all from multiple countries. As goods move from port to port, criminals have numerous opportunities to tamper with products. In addition, there is also an enormous amount of documentation associated with cross-border transactions, according to Paul Brody, Ernst & Young's (EY) Global Innovation Leader for Blockchain Technology. Although the supply chain and shipping industries have moved on from an all paper-based system to more of an electronic exchange, those systems continue to be siloed within a single company. "And what is going on is that we all have this digital information but we need a more efficient way to bring it under a single infrastructure," Brody said. "And that is what blockchain is doing – managing the physical aspect, financial aspect, legal contracts and operations in a single digital contract." IBM's crypto-anchors – such as ink dots or tiny computers smaller than a grain of salt – could be embedded in everyday objects and devices, Arvind Krishna, head of IBM Research, wrote in a blog post. "They'll be used in tandem with blockchain's distributed ledger technology to ensure an object's authenticity from its point of origin to when it reaches the hands of the customer," he said. Essentially, the crypto-anchors will not only serve as mobile sensors or transmitters but would also contain unique hashes that can authenticate a product's origin and contents, ensuring it matches the electronic blockchain record. In the case of liquids or metals that can expand with heat, the crypto-anchors can be outfitted with a special optical device and artificial intelligence algorithms to learn and identify the optical structure and features of certain objects. 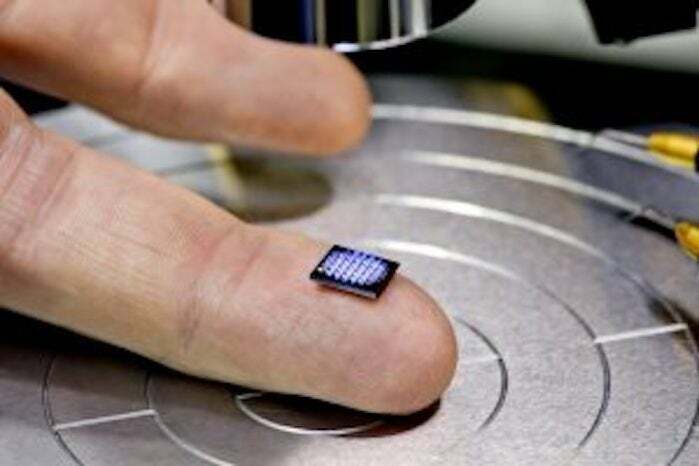 They can also identify the presence of DNA sequences in minutes, IBM said. The product-tracking technology, Krishna said, will open the door to new ways of handling food safety, documenting the authenticity of manufactured components, tracking genetically modified products, identifying counterfeit objects and guarding the provenance of luxury goods. Blockchain electronic ledgers are already being piloted in supply chains to track in real time goods as they transit the globe or simply move between a company and its suppliers. Challenges with blockchain remain, however, according to Brody. For example, data immutability on a blockchain makes it ideal for auditing purposes, but it that data is incorrect, it's also guaranteed to proceed forward on the ledger in an incorrect manner, Brody said. "You need to make sure that data is accurate, because that will be very important," Brody said. Blockchains themselves are incredibly resilient in that they are a distributed, decentralized network of independent nodes – making them extremely hard to take down as a whole. But the distributed ledger tech does have a weakness associated with the custom software built on top of it and on the edges of the network. "From a cybersecurity perspective, protecting the edges of the network from attack will be key," Brody said. "Attacks tend to flow toward the weakest points of the network, so even if the blockchain itself is resilient, if there are significant weaknesses in the IoT connectivity, those will be exploited."